Notepads are an essential office staple – so why not use them to promote your company? They’re lightweight, compact, economical and practical. Customized notepads imprinted with your business logo make great gifts to hand out at giveaways and special events. Because they’re so useful and popular, they’re ideal marketing products for providing current and potential customers with ongoing exposure to your brand. Your company will stand out from the crowd when you choose from our selection of Full Page, Half Page and Quarter Page Notepads. 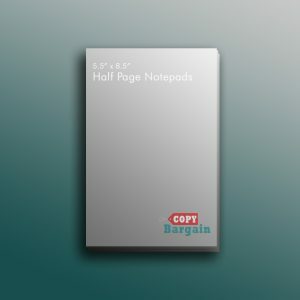 Here at Copy Bargain, we go the extra mile for our customers with competitive pricing and top-notch service on all of our custom-made online notepad printing orders. Notepads are an ideal marketing tool because they’re something that people use on a continual basis. Whether at home or in the office, nearly everyone can use more notepads for writing to-do lists, memos or grocery lists. When you order and keep a sizeable stash of our customized notepads on hand, you can give them out any time the opportunity arises, whether that’s to a current customer or a potential client. Then, each time someone writes a note on one of the pages, it will remind them of both your thoughtfulness in giving out such a practical gift as well as your company’s brand. Another great advantage of our online notepad printing service is that it’s designed to be extremely versatile. Perhaps you just want us to print a subtle logo in one corner, or maybe you want to include a graphic, photo, contact information or short message. The choice is yours. At Copy Bargain, we offer exceptional customer service, accuracy and fast turnarounds. Our goal is to make sure your experience working with our team is positive from beginning to end. When you choose to work with Copy Bargain, you’re putting your online printing service in very capable hands. We have what it takes to give you the professional, eye-catching results you’re hoping to achieve for your notepads. From our bargain pricing to helpful advice to commitment to quality, the team here at Copy Bargain wants you to be more than satisfied with the final product we produce for you. If you need help choosing from our Full Page, Half Page or Quarter Page options, we’re happy to assist you. We can even help you come up with an expertly designed custom logo for your business. We’ll check and double check to make sure each print job you order from us is completed correctly. 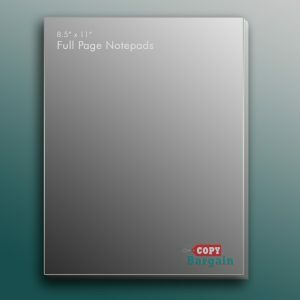 You can count on Copy Bargain for all your online notepad printing needs. We’re proud of the premier products and service we have to offer!